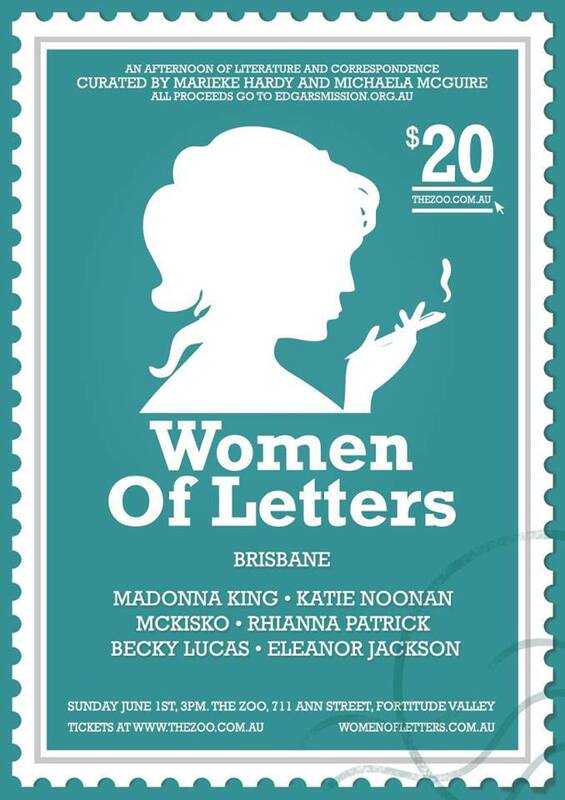 I’ve got a little bit of non-regret to announce gratefully that I am going to be a part of this beautiful event – Women of Letters, Brisbane, part six in a series. Brisbane friends! Melbourne literary salon Women of Letters has returned from its overseas jaunting ready to fling itself at you with open arms! Join co-curator Marieke Hardy and host Michaela McGuire for their SIXTH Brisbane Women of Letters event at their adopted home The Zoo, Fortitude Valley, as they welcome an all-star lineup featuring: Award-winning journalist, commentator and author MADONNA KING 4x ARIA Award winning vocalist KATIE NOONAN Adored chanteuse and winner of the Grant McLennan Fellowship McKISKO Comedian and Triple J Raw Comedy finalist BECKY LUCAS Radio presenter and former member of Triple J news team RHIANNA PATRICK Australian poet, performer, arts producer and radio broadcaster ELEANOR JACKSON These brilliant women will all be writing ‘A letter to my regret.’ There’ll be wine, cheese plates and the studious penning of aerogrammes, all in homage to the beautiful lost art of letter writing. At just $20.00 per ticket what more could you ask for? Just be quick, these shows sell out damned fast and WE DON’T WANT YOU TO MISS OUT. Join us for a most pleasant afternoon celebrating a diverse range of strong female talent whilst simultaneously raising funds for Victorian animal rescue shelter, Edgar’s Mission (http://www.edgarsmission.org.au/). It’s been too long between drinks, Brisbane – can’t wait to see you soon!